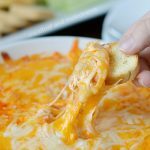 Instant Pot Buffalo Chicken Cups made with leftover chicken dip and wontons are quick and easy bite-sized appetizers perfect for game day and parties! 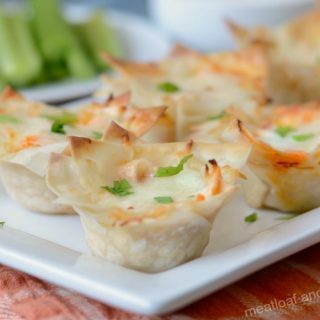 These Buffalo chicken wonton cups are a little different from most Instant Pot recipes because you’re starting out with leftover Instant Pot Buffalo chicken dip and turning it into a completely different appetizer. It’s a creative way to use up leftover chicken, and it’s definitely a quick and easy appetizer that you can throw together at the last minute. I almost didn’t call this recipe Instant Pot Buffalo chicken cups because you technically don’t need to have an pressure cooker to make them. 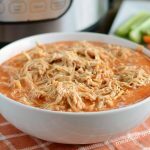 You can use the leftovers from Crock-Pot Buffalo chicken dip or even start from scratch with shredded Buffalo chicken or rotisserie chicken and a bottle of Frank’s ( or your favorite hot sauce) if you want. But seriously, you guys, making Buffalo chicken dip in the Instant Pot is so much faster and easier. Even if you don’t plan ahead and you need a last minute appetizer for game day or parties, you can whip these Buffalo chicken cups up in no time. These handheld appetizers are fun to eat, and they’re easy to make in a muffin tin. They’re perfect for football snacks, parties or whenever you get the munchies! You can make Buffalo chicken cups in a standard 12-cup muffin tin or a mini 24-count muffin tin. I used a mini muffin tin for these since I didn’t have much leftover chicken dip to work with, and I thought mini Buffalo cups would be a little easier to eat. Wonton wrappers are usually in the produce section of your local grocery store. I usually find them in the refrigerated section next to the pre-packaged salads and coleslaw mix. Just arrange your wonton wrappers in the muffin tin — I like to layer two in each cup to make them sturdier. Then, add some chicken dip, and top them off with shredded mozzarella cheese. Pop them into the oven for about 10 minutes, and that’s it! 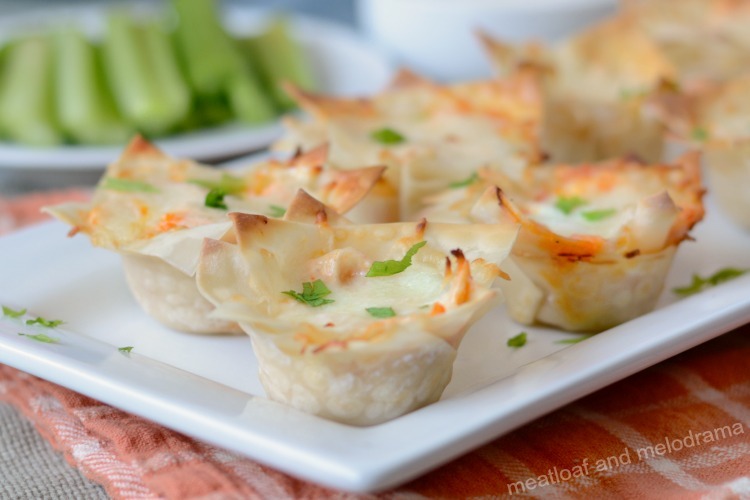 You might want to serve these mini Buffalo chicken wonton cups with some ranch or blue cheese dressing and some celery sticks. These bite-sized appetizers are on the spicy side! 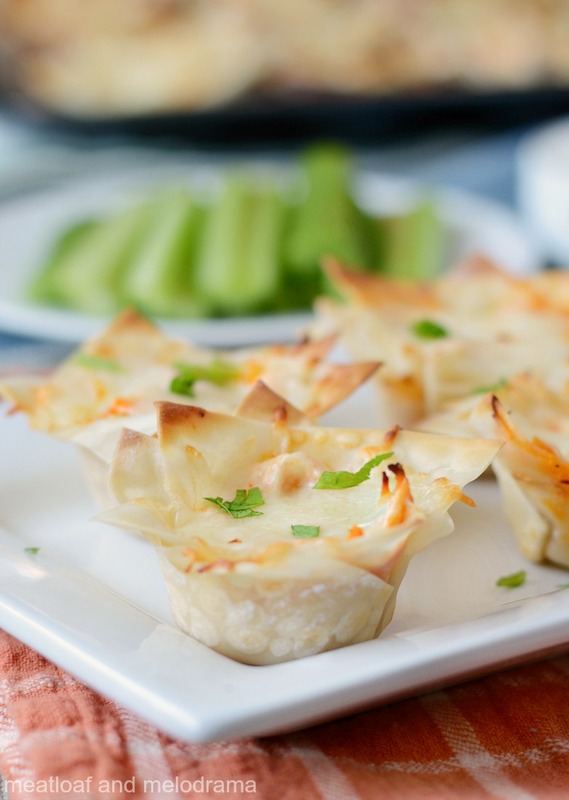 Looking for more wonton cups appetizer recipes? 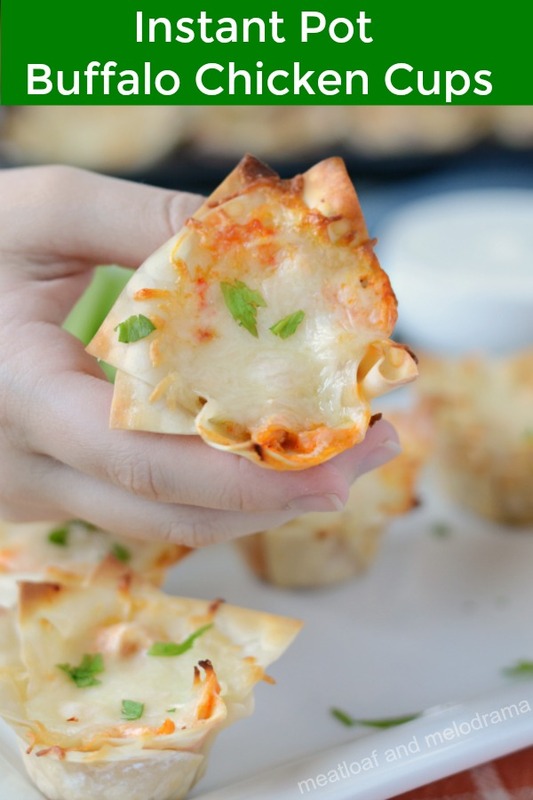 Instant Pot Buffalo Chicken Cups made with leftover chicken dip and wontons are baked in a muffin tin for a quick and easy bite-sized appetizer perfect for game day and parties! 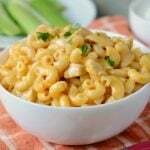 Recipe uses this leftover Buffalo chicken dip recipe for the chicken. You can also make wonton cups in a standard 12-cup muffin tin if you have more chicken to use up. I hope you enjoy these easy Instant Pot Buffalo Chicken cups! This looks like it might be a new fave of mine. Such a fun and tasty recipe !! Good job!! 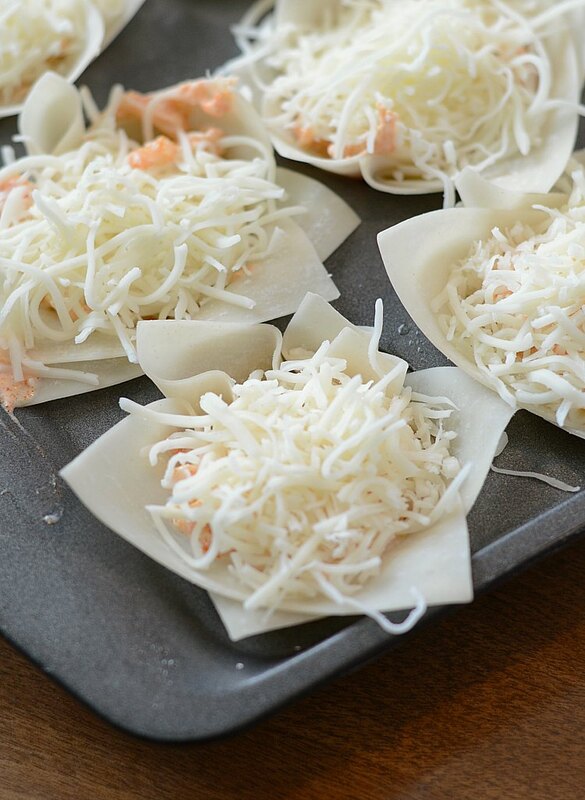 These wonton cups are perfect for a football party! So tasty! Great idea! These look so tasty! This is a must make at my house! We love buffalo chicken flavors! Same here, Amy. This always goes fast! Easy and delicious 😋! 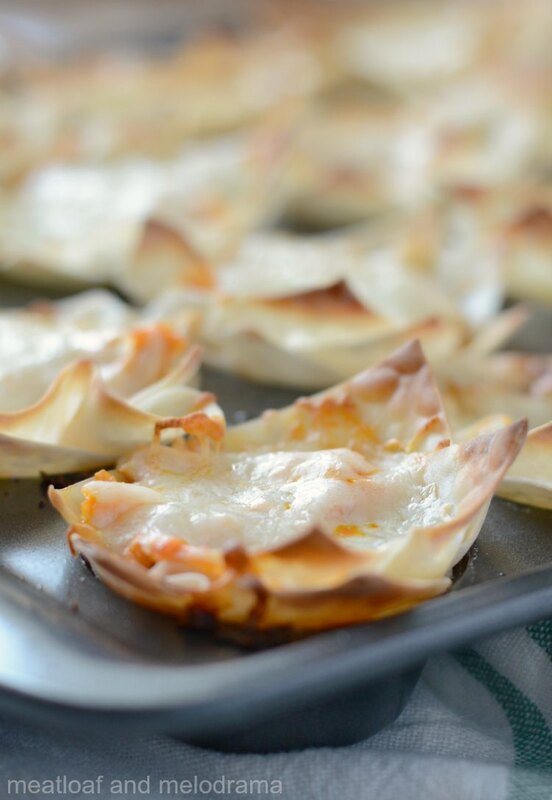 My kids will love this appetizer! These will be great little appetizers! Hope you are having a great week and thanks so much for sharing your post with us at Full Plate Thursday!